In Raleigh, NC (Zone 7b), there are approximately ten weeks before our big outdoor planting weekend. If you buy mostly vegetable starter plants for your home garden, this countdown may not be very significant (ten weeks seems far off ), but if you enjoy starting your plants from seed, this is a reason to scurry to action. Some plants require sowing seeds indoors 10 weeks before the last frost. 1) Why do I want to grow this vegetable? If I won't eat it, does it have some other value to me? There are several vegetable or herb plants over the years that I have grown just because I liked looking at them. Some I have grown just to try. If you have plenty of space to experiment, then whether or not you will eat the plant may not be a limiting factor to your selection. However, if you are starting small and know there are several crops you will definitely consume, maybe hold back on trying the strange variety until you have room to expand. Personally I love to experiment. Last summer I grew 20 varieties of tomatoes. It was very fun, but there were only several varieties that I really enjoyed eating. This summer, I am going to limit myself to just those few that I know I'll love. 2) Will it grow well in my yard and in my garden zone? Many factors influence whether or not a vegetable plant will grow well in your garden: sun, humidity, soils, length of growing season. Do your research and talk to other local gardeners. There will be years that certain vegetables just don't grow well, and it's not your location's fault. There was one year squash bugs and vine borers descended on my plants before I ever got to harvest a squash. However, squash are usually an easy plant to grow in my area. There are plants that year after year I have tried to grow, such as artichoke, that I just need to give up on. Study your zone. Study your neighbors. Don't waste efforts on all fussy plants. Almost every seed packet will tell you when to plant, whether to plant indoors or outdoors, how deep to plant, ideal spacing, how many days it takes to germinate, and how many days until harvest or maturity. Sometimes there will be a color coded map on the packet with planting zones and planting dates. Often packets will tell you when to plant based on an ideal night temperature rather than a frost date. 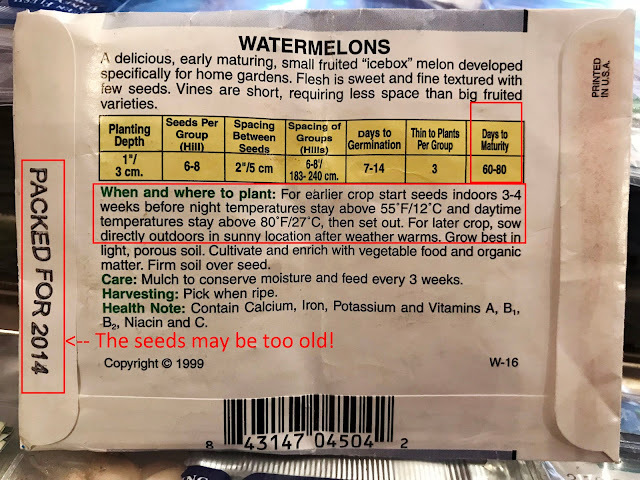 such as the watermelon seed packet below. Pay attention to the wording. You don't have to plant on just the first allowable date. For plants with a shorter time to harvest, you may have time to do multiple plantings so long as you have a long enough growing season. 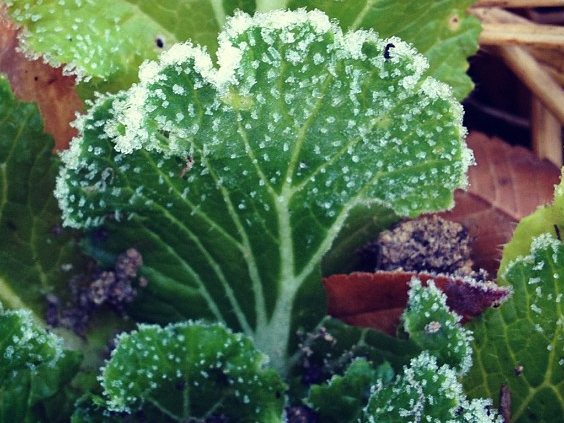 Your local growing season is the number of days between the last frost and the first frost of fall. If you have a short growing season, it is entirely possible to miss your window during which you have enough time to start a plant from seed and let it go to harvest. In this case, you can always buy starter plants. You also need to know your climate and plan accordingly. Cool season crops like spinach, cilantro, broccoli, and onions don't tolerate heat. So while I have a long growing season (my growing season is just over 200 days on average), the heat that comes on quickly reduces the window of opportunity to get a good crop of those cool season veggies and herbs. Many years my spinach has bolted before it grew a good stand of leaves. There are ways to work around this such as planting earlier and using cloches over tender plants on freezing nights, and planting in shadier areas may also stave off the head a little longer. This past year I planted cilantro in a pot on the deck with lemon verbena. The cilantro lasted all summer because after 2 pm, the sun is over the house and the deck is shaded. At 10 weeks before the last frost, I plant peppers. Every year I start my peppers at this time, and every year my peppers fuss about being planted too early by refusing to grow and dropping leaves. Yet every seed packet tells me plant peppers 8 - 10 weeks before the last frost. Peppers like a lot of heat. You would think with our early heat they would get a jump starts, but no, my peppers like to suffer first. As it was last summer, the heat came on fast, but it was also very wet. Peppers like heat, but they don't like too much water. I really should just wait to start my peppers, but I'm just too excited. As mentioned regarding the seed packet, the average low temperature can also determine whether or not the plant will thrive. For watermelons to thrive, I would need to wait to plant my seedlings outdoors until May. The following seeds can be started indoors 10 weeks before the last frost date: thyme, mint, chives, oregano, artichokes, onions, celery, leeks, and peppers. Determine your planting zone, your last frost killing date, and look up a chart of your average high and low temperatures. Pull out your old seed packets and consider disposing of anything older than three years. 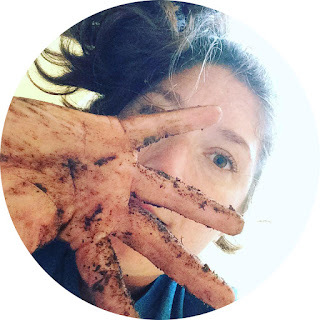 Make a list of what you want to plant and which seeds you need to purchase and hit up the local home garden centers or a friend who is willing to share. Gather supplies for making your indoor growing trays. Make a table of what seeds you will be starting and what week you will start them. 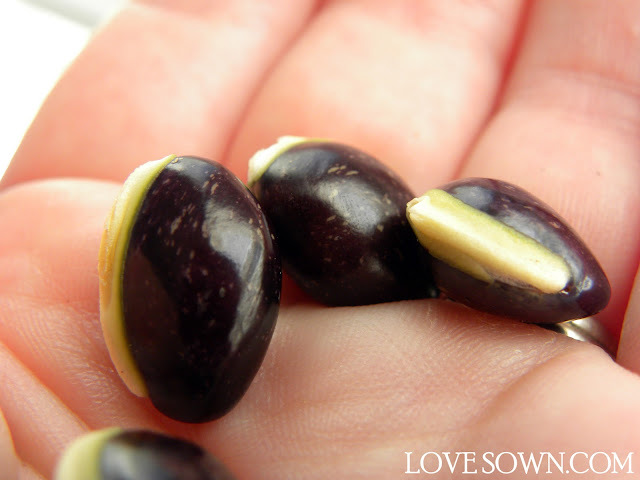 Plant your first batch of seed and set them in a sunny window or under a plant light. Small containers to plant your seeds in. Consider used paper cups, egg cartons, and empty trays from last year’s plant purchases. 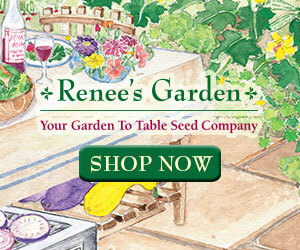 Domed seed-starting kits available at most home garden centers. There are also biodegradable peat cell trays and pots at most stores. For home-made greenhouses, you can use a ziplock bag to hold in the moisture and heat and let in sunlight. Planting media. If you have the kits, the peat pellets work great in these. Seed starting mix is also great. Plastic labels and permanent marker. Be sure to label everything you plant. Chances are you won’t remember what you have, which is important because each type of plant has its own set of requirements. This post contains affiliate links. Purchases made through my affiliate links give me a small commission to help run this blog, but don't cost you any extra. Which cucumber variety do you plant? And also, what about the tomatoes and beans? I like pole beans for space-saving, and like any variety that is long and tender and not too stringy.